The problem with movies is that all too often they're lacking in one or two fundamental areas, and unfortunately these are normally the plot or the characters. The first installment of this series suffered from the latter, and while it was still enjoyable even with that flaw, there was always the nagging feeling that something wasn't quite right. Thankfully this episode begins to address that issue. The second installment in the Kara no Kyoukai ~The Garden of Sinners~ franchise, Satsujin Kosatsu (Murder Speculation), is actually part one of a two part story arc (viewers will have to wait for the seventh movie to see the conclusion of this episode), yet while this small irony is amusing, the are some flaws with this episode which one can only hope will be rectified with the final movie. 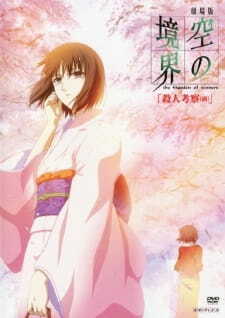 This time around the story takes place over two years prior to the events in the first movie, and thankfully the main theme is the developing relationship between Ryougi Shiki and Kokuto Mikiya during their time together as high school students. Kokuto finds himself strangely attracted to the seemingly aloof Shiki, and proceeds to befriend her until a bizarre series of murders takes place. Now the nice thing about Satsujin Kousatsu Part 1 is that the plot takes a far more measured approach than Fukan Fuukei does, and while the pace picks up towards the end, there's something here that was somewhat missing from the previous installment - a sense of purpose. While the first episode was entertaining, there was a certain aimless quality about it due to the underdeveloped characters that permeated the quieter moments. This movie begins to shed some light on the actions of both Shiki and Kokuto during that time, especially on certain aspects of her behaviour and personality. The story is generally much quieter in tone than before, which may not sit too well with those who liked the frenetic action of Fukan Fuukei. This is a necessity as the anime of Satsujin Kousatsu Part 1 is to offer the viewer some perspective on every other movie in the franchise, and the clarity it provides may force viewers to reassess their opinion of the first installment. Once again Ufotable produce the goods with regards to artwork and animation. The character movements are excellent, and the incorporation of CG is almost seamless in respect of the backgrounds and backdrops. There are fewer action sequences this time around, but they are just as good here as they are in the first movie, especially when it comes to choreography and use of environment. As for the the character designs, they're a little different in that both Kokuto and Shiki have a certain youthful quality about them, which is reflective of the fact that this story takes place two years before the first movie. Sound is, again, extremely good overall, and the movie uses the various effects well, however there are some issues as there are occasions where the various noises clash to create a veritable cacophony. This doesn't really detract from the movie though and, surprisingly, actually improves certain sequences. The music throughout the movie is generally utilised to good effect, often enhancing the atmosphere in a particular scene. The voice actors are also very good, and are able to show some real talent with regards to their respective characters, however given that this is the second movie in a series of seven, this should come as no surprise. What is surprising though, is that the lead seiyuu are able to instill their respective characters with a degree of naivety and innocence, something which improves the overall effect of the movie no end. Unfortunately that's not enough to raise the characters from their stupor. While there is very clearly some development occurring over the course of the movie, one of the issues that seems destined to repeat throughout the franchise is that the plot doesn't give them enough time for this growth to set as part of their persona, and that leads once more to an imbalance in the storyline. The revelation about Shiki's personality goes some way to explaining why she is the way she is, but Kokuto is the real problem. As a character he is simply bland, and at no point does the movie go into any detail about his goals, thoughts, ideals, etc. Everything in the movie actually revolves around Shiki, including Kokuto, and all of his actions stem from that one driving principle. Unfortunately this feels like a missed opportunity to add some real meat to both the leads, but it may be that all of these concerns will be addressed by the time the series ends. The other problem was the lack of Aozaki Touko. It would have been a nice addition to have more information on her from that time period as she is one of the mysteries of Kara no Kyoukai, and in all honesty this could have been done simply and easily. Sadly, the fact that she has not been included in this movie means that it has a slightly disjointed feel compared to the first, but again this may be rectified with the second half of this story arc. Even with those flaws this is still an enjoyable movie, and it's nice to finally see how the two leads met and got to know each other. It would have been nice if the plot wasn't focused so much on Shiki as this would have allowed for some introspection of the part of Kokuto. On the plus side, the slower pacing of this speisode actually adds to the tension this time around, but like the first movie the plot continues to retain a degree of predictability. Fans of Fukan Fuukei will be pleased at this second offering as it is very much in keeping with the spirit of the series, however I would advise against making snap judgements about the whole franchise simply on the basis of this or the first movie. As before, I look forward to the next episode. Kara no Kyoukai 2 exceeds the first movie in almost every aspect. There is depth to Shiki that was absent before, new settings are introduced to a much more comprehensible degree, the supporting cast are more prominent and the writers - instead of being cryptic - present a largely compelling and well developed story, solidifying the series' true roots. The first installment threw audiences into a mystery unfortunately dulled by the lack of depth to the characters, but the second installment lays down the groundwork, exploring the origins of Shiki and Mikiya. The story is well executed and - unlike in the first film - has a real sense of purpose, progression and development. It's a compelling origins story, where Shiki and Mikiya's relationship is genuinely captivating to watch unravel (especially given the eerie undertones); much more befitting as an introduction to the septenary. The film chiefly explores Shiki and Mikiya alone, with little room for anyone else in the run-time, but the film still feels a lot more 'alive' than the first installment. The supporting cast are more pronounced, with the locations well explored; there's a better sense of the setting than before. Of the two main characters, Shiki is particularly well developed, we see her many sides and for the first time get a real understanding of who she is. Mikiya, on the other hand, comes across as rather dull and more a vessel to further explore Shiki than an important presence himself. As in the first installment, the animation and art style remain consistently strong, though with more dialogue-heavy sequences this time around, it is perhaps not as dynamic. Nevertheless, the art is crisp and detailed - Shiki's eyes are ever-beautiful, as are the locations - with the staff exquisitely animating a number of terrific dramatic scenes. The visuals are impressive, though the cinematography could have been more absorbing, with certain shots becoming a little banal. There's no stunning insert song this time around (though Mikiya hums Singin' in the Rain which is a nice little nod to a classic), but the background music is ever prominent. There are a number of immersive tracks that blend well with the visuals - ultimately creating some very coherent, well put together and atmospheric sequences - with the more uptempo tracks complementing the action sequences well. Kara no Kyoukai 2 isn't a masterpiece, but it's a huge improvement over the first installment. It's a well constructed origins story with a lot of depth and promise, offering the series its groundwork. Here's hoping the septenary continues to climb. This was SO frustrating to watch. This was supposed to be a character study, but they got the psychology of the characters SO incredibly WRONG. The male lead is irritatingly saccharine, bland, and delusional. My suspension of disbelief was finally broken the moment he was faced with two options, and he chose the one that if you took a thousand people outside of a mental institution or badly written anime, you would not find one that would have made the same decision. The murders and the people murdered are glossed over. The murderer has psychological issues - any understanding of actual psychology better left at the door - to make the character and movie seem profound and beyond our grasp of understanding, and the murderer falls ill to increase their sympathy rating and to be able to continue using them in subsequent movies. As the movie progresses you discover it's a moody character study of badly drawn cardboard cutouts. It gives us a deeper understanding of the cardboard mind, and is moody about it. Who needs that? This is a sequel to the 1st KnK......kind of....Well, not exactly. You see, KnK is not being shown in chronological order and as such should not be watched in chronological order. I almost made a grave mistake of doing so. The story of KnK 2 takes place 3 years before the events of KnK 1. Mikiya, while walking home from school, meets a mysterious girl who he thinks is cute and starts falling in love with her. A month later, he met her again during the high school entrance ceremony. The mysterious girl that he met is named Shiki Ryougi. Meanwhile, the city is experiencing a series of bizarre murders but no suspect has been caught yet. The events may have taken place before the events of the first KnK but the movie shows us how the 2 characters met and why there's a connection between them. It's starting to connect some of the dots but there's still obviously a lot of unanswered questions that will be answered later on in the movies. So far, I'm liking the story. The gruesome murders, the mystery around it, etc. Do I need to review the animation? I mean, it's still the KnK series and nothing really changed from the first one which is already perfect and visually stunning. The soundtrack was perfect in the first movie but somehow, the soundtrack here is.......inferior to the first one. Granted, there are some themes that are great but it didn't quite stand out like the first one did. The voice actors are all the same so my opinions on the VA still stands. The first movie didn't really give us any great details about the 2 main characters and why I should really care for them. The 2nd movie showed us the main character's past, how they met, what connections do they have, what they were like back in high school, etc. The movie is now developing the characters (not too developed yet) and they're giving me a few reasons on why I should give a crap about them. I'm also starting to understand more about Shiki and her "dual personality" and why Mikiya cares for Shiki. In short, the movie just showed us a hour of character development for the 2 main characters. The second movie of the KnK series is not better than the first movie but it's not worse either. It gave us more in-sight about the characters. The movie just created more plot holes for me but there's 5 movies to go so I'm not going to complain that much. For the love of god, if you're watching KnK 2 first because you're watching it in chronological order then don't. The KnK series is meant to be shown out of chronological order and should be watched out of chronological order.